Très belle robe rouge violine et dense. Le nez développe des arômes frais de violette et de fruits rouges avec une pointe minérale et un soupçon d’épices comme le poivre gris. En bouche, bien équilibré entre fraîcheur et densité, ce vin révèle des tanins soyeux et de beaux arômes de réglisse et de fruits rouges, se prolongeant sur des notes de violette. L’alliance parfaite entre équilibre et gourmandise. With a bit more stuffing and texture than the charming 2016, the 2017 Crozes-Hermitage Maison les Alexandrins should prove to be superior. There’s an herbal, grassy note on the nose but also potent black cherry fruit. It’s full-bodied, with a creamy, plush texture on the mid-palate that turns velvety on the long finish. 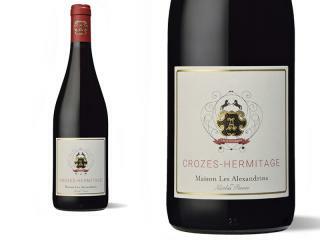 The 2017 Crozes Hermitage sports a saturated purple color as well as a big mouthful of blackberry and black cherry fruits, incense, and peppery herb aromas and flavors. It has good acidity, medium body, present tannins, and plenty of length, all making for an outstanding, high-quality wine that will keep for 6-7 years. From young vines from the southern Terrace de Chassis section of Crozes-Hermitage on clay-limestone soils, aged in triconic oak vats. The focus of this wine is on the succulent red fruit, backed up by liquorice and gentle spice, and a lovely sense of balance. This is subtle, enticing and unfussy, with tannins that tread lightly but with purpose. Due to be bottled in late September.